Dupuytren’s contracture (Dupuytren’s disease) is a condition that affects the hands and fingers. It causes one or more fingers to bend into the palm of the hand. It can affect one or both hands, and sometimes affect the thumb. Dupuytren’s contracture occurs when the connective tissue in the palm thickens. Often the tissue thickens in one small area first and a “nodule” forms (a small, hard lump about 0.5-1cm) under the skin of the palm. The nodule sometimes feels tender to begin with, but this usually passes. More nodules may then develop. The nodules are non-cancerous (benign) and the condition isn’t life-threatening for those who develop it, although it can be difficult to live with. Over time, the nodules can extend and form cords of tissue. These cords can shorten (contract) and, if the cords run along a finger or thumb, they can pull it, so it becomes bent towards the palm. These contractures are often mild and painless, but they can get steadily worse over time. The exact cause of Dupuytren’s contracture is unknown, but it’s thought to be related to your genes, as it often runs in families. If you have the gene that causes Dupuytren’s contracture, other factors such as diabetes, smoking and certain medications (for example, medication for epilepsy) may activate the condition. However, it’s not clear how significant these factors are. Dupuytren’s contracture is fairly common. It can affect both sexes, but affects men more than women. The condition usually occurs during later life, although cases have been reported in children. Most cases occur in men over 50 and women over 60. The condition seems to be more common in people of North European descent. It’s thought the gene associated with the condition was brought to the UK by the Vikings. 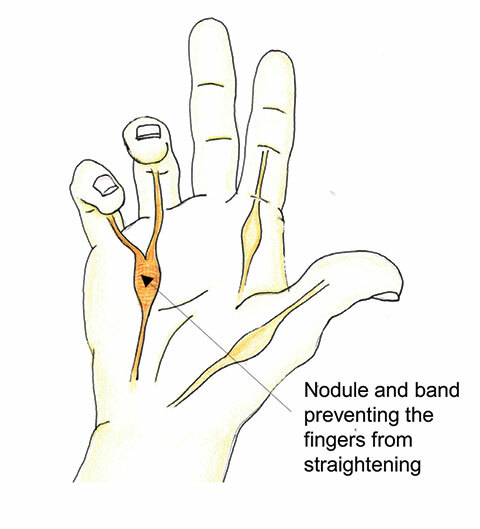 As the exact cause of Dupuytren’s contracture is unknown, it may not be possible to prevent the condition. However, if you’re at risk of developing the condition – for example, if you’ve had it in the past, or if you have a family history of it – stopping smoking (if you smoke) may reduce your risk. Surgery will give you back the use of your hand and straightened fingers and is by far the most effective treatment for this condition. This is performed as a day case and you will go home the same day. The surgeon may make a cut in the fibrous tissue in the palm or remove the fibrous tissue repairing it with skin grafts. The choice of anaesthetic procedure depends on the surgical technique. Keep the hand and fingers moving gently; exercise helps everything to return to normal more quickly. Check with your consultant before exercising. The hand may take a little time to settle down and feel normal again.